On Saturday 13th September, a team of 20 cyclists set off from Ripon to take part in the 2014 Sainsbury’s Big Bike Ride. Each rider represented their own store with their own story to tell. 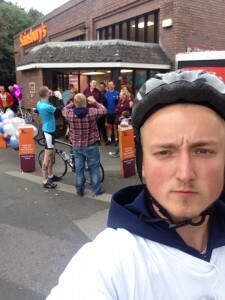 Raising funds for The Joseph Salmon Trust and representing Sainsbury’s Brighouse was Kieron Baker, 21. The Sainsbury’s Big Bike ride was certainly a challenge for wholesale nfl jerseys from china Kieron and it was a fitting time for the ride, following on from the Tour de France earlier in the year. Kieron says “We started early in the morning from Ripon, North Yorkshire and went to various Sainsbury’s stores on the way including Harrogate, Bradford, Otley, Keighley, Halifax and finally Brighouse! Most of the route was very hilly and was used by the Tour de France cyclists. There were still British flags hanging in towns and writing on the roads! Pictured above are Kieron’s colleagues and staff from the Brighouse store. Joining him at the finish line were Neil and Rachael Salmon from the Trust along with their daughters. So how did Kieron feel at the finish? “Relieved, exhausted and proud.” says Kieron. Sainsbury’s Brighouse have chosen the Trust as their Charity of the Year for 2014/15 and we look forward to working with them and fundraising together.